Paterson 3-reel Super System 4 developing tank. This tank can accomodate 3 reels of 35mm film, two reels of 120/220, or the Mod54 adapter for 4x5 sheet film. Reels and Mod54 accessory are sold separately. 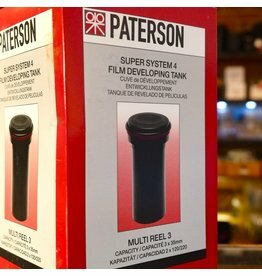 Paterson Super System 4 3-reel developing tank.